Warm milk. Remove from heat and add chilies. Cover and let steep for 45 minutes. Remove chilies. Stem and seed and set aside. Wisk cocoa powder with ½ of the sugar and add to milk. Warm milk. Add chopped Ibarra chocolate and salt. Stir until chocolate is completely melted. Whisk yolks with remaining sugar and temper with chocolate milk. Make custard base. Pour cream in bowl set over ice bath. 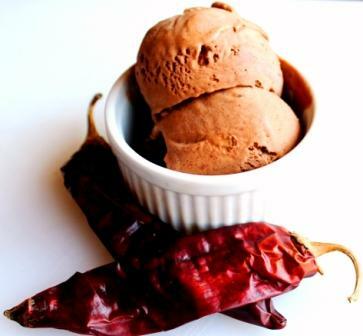 Emulsify custard with ancho chiles and pour through sieve into cream. Add vanilla and cool. Cover with plastic wrap, refrigerate at least 8 hours. Pour through sieve again. Pour mixture into ice cream maker and process according to maker’s directions. Cover and chill. This entry was posted in Uncategorized and tagged cooking, dessert, food, Foodie, gelato, Hot Chocolate, Life, personal, random, Recipe by Julie "Phoren" Seyler. Bookmark the permalink.